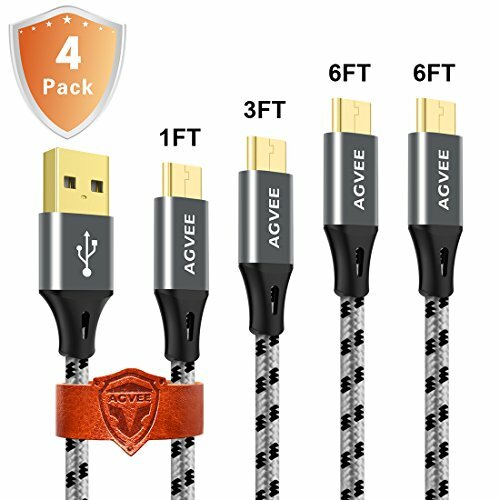 Take the fast lane and charge your devices 40% faster with this set of Agvee 3A Micro USB Cables. Measured loop resistance less than 280mΩ, voltage drop less than 0.6V when current is 2.4A. Why waste time waiting for your phone to charge? Speed it up with supreme quality wire structure. The tinned pure copper conductor and the TPE cable sheathing survive even at -50 degrees. This Micro USB cord is designed for the harshest routines. No damages. No performance drops. The premium nylon fabric and enough pure copper secures a 100% durable and efficient charging. Perfect Fit: Built to fit the latest devices. Just plug and charge without removing the case. Very Important: Micro USB is the traditional USB interface. It's different than the new android USB C Connector. Please check out the photos here and your device (make sure they fit). Other Micro usb connector devices: Bluetooth Earphone, GPS, Wireless Charger, Bose SoundLink Color Bluetooth Speaker I , II , III, Bose SoundLink Mini II, Bose SoundLink Revolve / Revolve Plus, QuietComfort 35 Wireless Headphones, JBL bluetooth speaker. If you have any questions about this product by Agvee, contact us by completing and submitting the form below. If you are looking for a specif part number, please include it with your message.